Portland's Thermals are getting ready for the release of their Saddle Creek debut Desperate Ground, and have now revealed that they'll support their latest punky set with a chunk of North American tour dates. The band's mostly U.S. tour schedule kicks off with a hometown show on April 20, but the itinerary has the act heading up to Canada too. Gigs have been booked in Vancouver, Toronto and Montreal. You can peep the details down below. 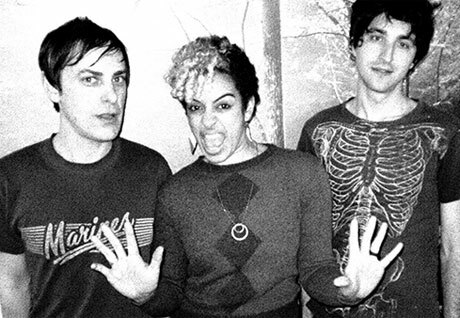 On top of those newly announced dates, the Thermals have also premiered a new set of visuals for "Born to Kill." While the trio had served up a lyric video for the crunchy power-pop cut, they've since fitted the track with some bloodied-up visuals. Singer-guitarist Hutch Harris grins like a madman the whole video through, whether chomping on branches in a forest or getting punched-up by a pair of suited agents in some hidden room. Harris sings on the punky cut about having blood on his hands, but we see more of his own goo spilling over his shirt at the hands of his captives. You can see the dude's ultimate destiny in the clip down below. As previously reported, Desperate Ground drops April 16. The band also served up a series of reissues earlier this month.